Rail Coach Factory Recruitment 2018 RCF Kapurthala Invites young 10th pass students to become Railway Employee in Kapurthala Rail Coach Factory. The Most Advantage is you are getting central govt jobs under 10th pass eligibility criteria. To Know More update kindly refer some items of words below. RSMSSB Computer Operator Recruitment 2018 Apply Online for RSMSSB Sanganak Recruitment 2018 before the last date of Online Application i.e.27.03.2018. We have given up to date knowledge for 400 Computer Posts in pdf file format. For More details RSMSSB Computer Job Vacancies check below. 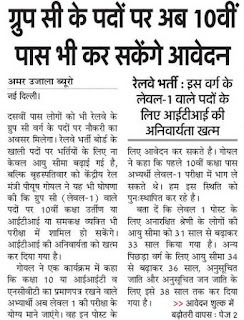 RRB Group C Recruitment 2018 Indian Railway Minister Piyush Goyal Said Only 10th pass people can apply for all Group C Jobs in Indian Railway. Previous Main Eligibility Criteria to Fill Railway Group C Bharti 2018 it was ITI, Diploma or Polytechnic but now rule is now cancelled to add more Job seeker having great qualification in from 10th pass to Graduate in Any Stream.